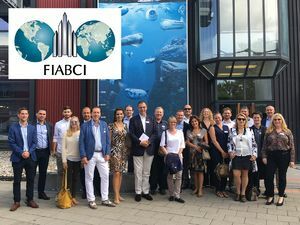 This year the FIABCI Switzerland received a delegation from FIABCI Austria and FIABCI Germany to celebrate the annual Case Story. IMMOMIG, as one of the sponsors, was present at this extraordinary event. On Thursday afternoon we were welcomed by the FIABCI. The event began at 3 p.m. in the Swiss National Museum at Zurich with a two-hour tour on the theme "Zurich's architecture - the characteristic architecture". At the end of the day we enjoyed an aperitif and dinner at the historic site of Zurich's old town to continue the professional exchange with our guests from Austria and Germany. On Friday morning we met again in Lucerne at the Swiss Museum of Transport. Under this year's motto "Business premises" we get an overview of the requirements for more than 500,000 admissions per year in the most visited museum in Switzerland. After a short drive to nearby Ebikon we visited the "Mall of Switzerland", where we were given a guided tour and inspection of the building technology (HVAC, delivery, disposal, etc.) as well as a deep insight into the functioning of a shopping and leisure centre and the associated management.